Eighteen months after teenager Trayvon Martin died alone one rainy night in Sanford, Florida, his killer, George Zimmerman, endured the scrutiny of a highly mediated investigation and criminal trial. Yesterday, we learned that a jury of his peers found him to be not guilty. The jury declined to charge him with either second-degree manslaughter or even of the lesser charge, murder. Over the 18 months, I tuned into the rolling fortunes of this case. For instance, I wrote an earlier post here, trying to contemplate the unimaginable pain, Sybrina Fulton, might have endured during her first Mother’s Day without her son, Trayvon. 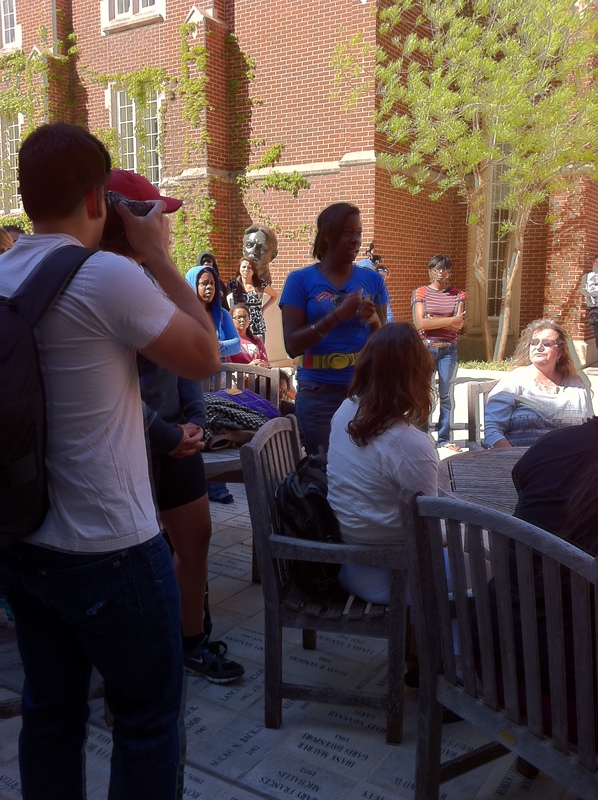 But earlier, during one of my Spring 2012 class in Race, Gender (Class) and the Media, some of my students were so passionate about the tragedy of Trayvon’s death, they helped organize campus rallies and marches requesting that Zimmerman be charged and tried. When it became apparent that the main rally and march would occur during our class time, I invited one student to speak to the class of around 50 about why they were involved, and why they believed we all should go to these activities instead of class. She was so convincing that all agreed to attend, and the shared experience gave us many fruitful conversations in later class sessions. 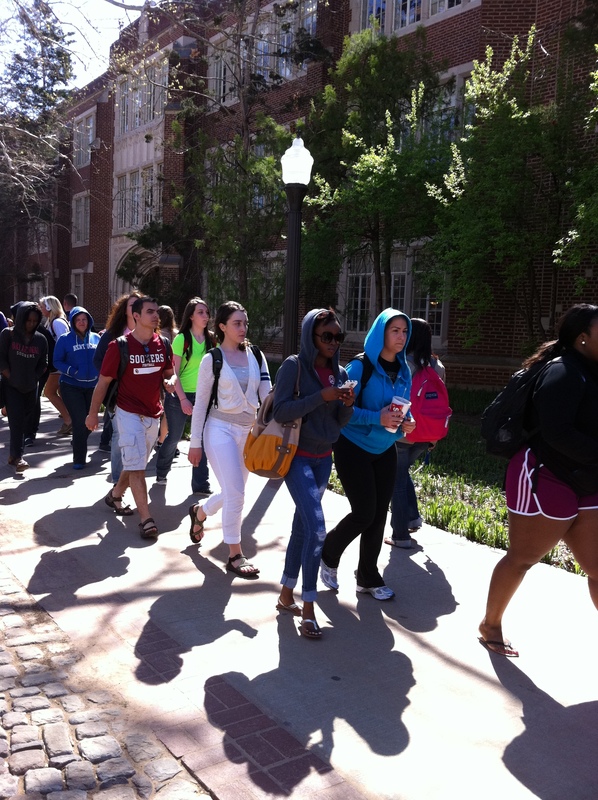 One of my students speaks at an OU Rally in March 2012 about Trayvon Martin’s death. Photo Credit: MGCarstarphen. Incredibly, it was a battle, waged with strategic events and high-profile media coverage, that helped put Trayvon Martin’s death in the spotlight. And if we review the case’s timeline, it is striking that although Martin died February 26, 2012, it wasn’t until April 11, 2012 that George Zimmerman was charged and a criminal trial became a reality. Some of my students participated in the Trayvon Martin march after the earlier rally, and after the time for our class had officially lapsed. Photo credit: MGCarstarphen. It took a highly successful public relations campaign to make this trial possible. Now, in the aftermath of its verdict, it will take more than a poorly conceived public service announcement to resolve the deep issues this trial reflected. As the jury began its deliberations, it took a conversation with someone whose opinion I value greatly to show me how perilous the path to a finding “without a reasonable doubt” could be. To me, and for many others who believed that this encounter between an unarmed teenager and an adult man with a gun was inherently unfair, a guilty verdict seemed inevitable. But unfairness is not necessarily a legal standard, and this trial really put notions of self-defense, danger, and individual rights to stringent tests. Zimmerman’s defense turned on his evoking his rights to defend himself in the face of “imminent danger” as part of Florida’s “Stand Your Ground” laws. In principle, this may seem like a logical extension of a citizen’s right to protect him or herself. But, in practice? As this Salon article describes, race proves to be a powerful indicator of who needs protecting, and who can be perceived as a threat. At the end of the trial, the jury received lengthy guidelines to follow as it considered its verdict. In order to render a finding of murder, the members of the jury had to be convinced that George Zimmerman acted with “an intent to cause death” beyond a reasonable doubt. Did George Zimmerman really mean to murder Trayvon Martin? How could he have an intent to murder him?….he didn’t even know him. How could a man like George Zimmerman, with no criminal record, a loving family and a community of loyal friends, decide to murder a stranger in cold blood? It doesn’t make sense, unless something happened….unless he was provoked to it….unless he was truly afraid. These are the words of “reasonable doubt” because it is hard for any of us to believe that a sane person would murder someone unprovoked. But the residual, enduring effects of racism warps the logic of what is reasonable, and makes sanity look insane. I believe George Zimmerman was afraid, but unless you factor in race, we won’t truly understand why. Imagine if Martians arrived to the United States, unknown to us, during the weekend and watched local news coverage. No matter the city or town they were in, they would notice a parade of “crime” news, featuring the menacing faces of usually dark-skinned, male perpetrators at the center of tense encounters with police. How long would it take them, even without knowing our language, to recognize who represent the most fearful threats to our society? It is not that criminals of color don’t exist—they do. But crime is a pretty multifaceted set of offenses, and criminals come in all colors. Ask Bob McDonnell and Virginia constituents about the news trending in their state. But scholars such as Robert Entman, Travis Dixon and others have documented in multiple studies that the incessant display of criminality in local news featuring men of color as assailants creates irrational fears in white viewers about the nature of crime in their communities. Here is the striking thing: these patterns exist in local news operations everywhere. Is there one master producer who is controlling all of these newscasts? Nope. But there is a master narrative at work and few of us are immune. George Zimmerman certainly wasn’t. Look at his comments during his infamous 9-1-1 call to police, referring to Trayvon as one of those “f-ing punks” and “assholes” who always get away. Look at Zimmerman’s decision to follow Martin, despite being told not to. Look at Zimmerman’s dispassionate demeanor, according to the police reports and their own eyewitness testimony, as he watched an unarmed 17-year-old boy he did not know die as a result of his choices. I believe George Zimmerman met and killed a stereotype he greatly feared that night, writ large through the persuasive power of a racial profile that was at the heart of this case. The real tragedy is that he didn’t even see Trayvon as the person he was—a teenager, unarmed, in the rain, trying to get to a place he had every right to be. Home. This trial may be over, but the conversation must continue. What do you think?